I have been working with graph visualizations for almost 20 years now, but only recently have I begun looking into graph databases. Shortly after I got introduced to Neo4j, I found that when looking at existing dataset examples I often felt the need to look at and better understand the underlying schema of the data. Although a Neo4j database does not need a schema, most of the time data will adhere to a schema and without one, creating elegant and efficient queries to gain insight into your database becomes rather difficult. I spoke with other Neo4j users, and they told me that they had come across the same problem. In larger projects, there should be a separate documentation about the database schema, but as it is the case very often with documentation, either it doesn’t exist or it is out of sync with reality. The built-in Neo4j Browser will show you a list of all node labels, all relationship types and property keys currently in use in the sidebar. Clicking on each of them, the Neo4j Browser will sample a few random nodes and relationships and render them to the screen. You can then interactively explore the actual graph data and build the schema in your head or using pen and paper. If you have installed the APOC tools at your server, you can make use of the awesome meta graph APOC procedure to automate this sampling: The procedure will create results that the Neo4j Browser can actually display as a graph. Some people may not have the APOC tools installed or cannot install them at their server. Luckily, starting with Neo4j 3.1, there is similar functionality built right into the database. Sending a call db.schema() query to the database, you will get a response that looks like an ordinary query result with nodes and relationships; however, the entities are purely virtual and do not exist in the database. For very small instances with a simple schema, this may already be enough for you to get a good understanding of the structure of your database. However, while the current implementation of the graph viewer in the Neo4j Browser is fine for displaying smaller result sets, it does not work very well for non-trivial schemata. In the above screenshot, you can see the results of calling db.schema() on a Neo4j instance that contains data about social activities of the Neo4j community. Relationships between Twitter, Stack Overflow, Meetup, and Slack users – along with their public activity – and interactions has been collected in this database. However, in the screenshot you can’t actually see a lot more than what you can see from the list of existing node labels, except for maybe the confusing fact that a GitHub labeled node created a GitHub labeled node. Also, many of the node labels have been cropped, and almost all of the relationship labels cannot be seen in the diagram. If you start looking more closely at the output of the db.schema() call, you will see that there are some node labels that seem to be connected to a large number of other labels. In the example above there are labels like StackOverflow, GitHub, Twitter, Meetup, and User which have a very high connectivity. This will give you an empty list, since there is no combination of labels in the whole database that only consists of the “StackOverflow” label! Instead, the label is used as a “tag” in combination with other labels only. With this knowledge, in order to better understand the schema, we can actually manually remove those “tagging” nodes from the graph display. We won’t lose any relevant schema information since the relationships are still there for the other labels that the tagging label was used in combination with. And if we remove the User label too, we will remove all Users and their interactions and relationships from the schema. Actually, the schema should better show a different structure: It now shows a type of “User” who posts questions on Stack Overflow, tweets about his or her work on Twitter, and meets his or her fellow developers at Meetups. We see a single User that participates in all of these relationships. However, if we look at the actual data, we will see that only Twitter Users tweet, and only Stack Overflow Users post questions and answers on Stack Overflow. Thus, in reality, in the database the schema should be drawn with separate types of Users. One for each “tagging” label combination that they appear in. 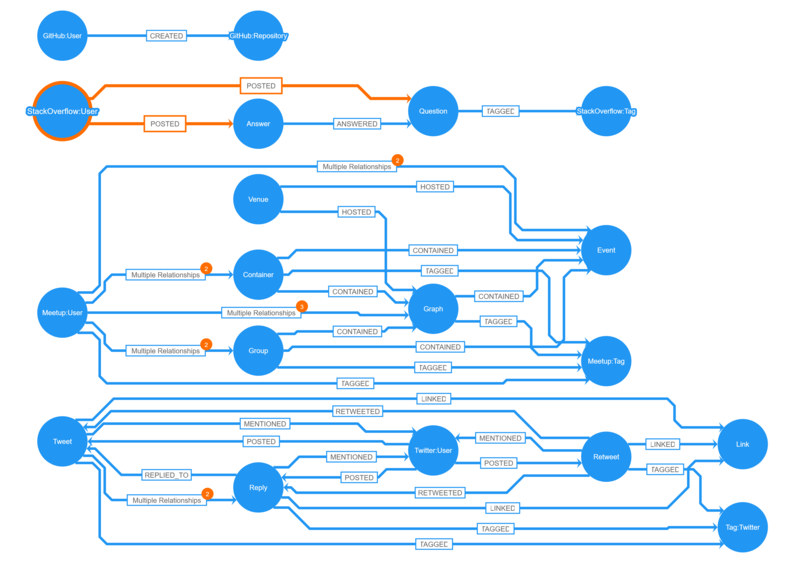 At this point, it becomes clear that the current implementation of the graph visualization in the Neo4j Browser does not suffice for rendering more complex database schemata. Graph Visualization to the Rescue! “yFiles” is a generic graph visualization, drawing and editing library for programmers that comes with the most complete suite of automatic layout algorithms. It also features extensive customization options, and as such, can be used to create completely new applications that exactly suit one’s requirements. Therefore, I was positive that I could easily build an application that allows users to quickly and efficiently browse and understand the schemata of even the most complex Neo4j graph databases. That was all I had to do to get the basic schema to display in my own application! I just plugged the above code into one of the samples in the getting started tutorials for yFiles for HTML and was immediately able to interactively explore and finally understand my database schema! Of course, I didn’t stop at this point. I was excited to see what one can create when the power of Neo4j and the yFiles libraries is used together in the same application. So I added an option in the context menu for the user to automatically split node labels into all of their label combinations and update the relationships accordingly. So Stack Overflow users in the database do not participate in a meetup and do not create GitHub repositories; they will post answers and questions and the schema should reflect that! Now that I finally understood the structure of the database, I was eager to dig into the actual data. I already had the code that enabled me to run a Cypher query and import data for the purpose of graph visualization into yFiles, and with the help of my cleaned up schema, I wanted to interactively explore the data that I was interested in. We added the ability to quickly specify filters for nodes and relationships, so that during the exploration, only those nodes were considered that you are interested in. This can be done via property filters or directly in the schema view where relationship types and node labels can be “disabled”. To actually see something, we added a master detail view so that all of the properties of the currently selected item can be seen and we added the ability for the user to interactively create and modify SVG templates for different node labels that use data binding and property mapping to dynamically create pleasant visualizations for the nodes in the graph. 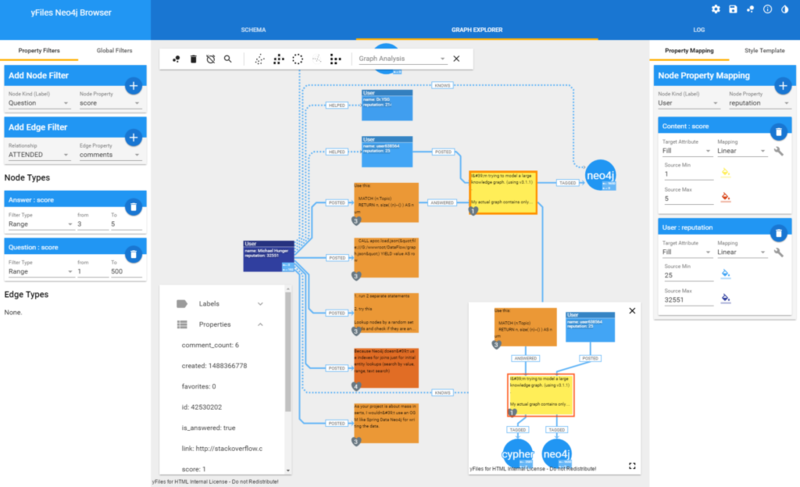 A set of preconfigured different automatic layouts and graph analysis algorithms was just as easy to add as a dynamic neighborhood view, as well as PDF creation and image export and the option to export to GraphML for loading the graph into our free diagram editor yEd. 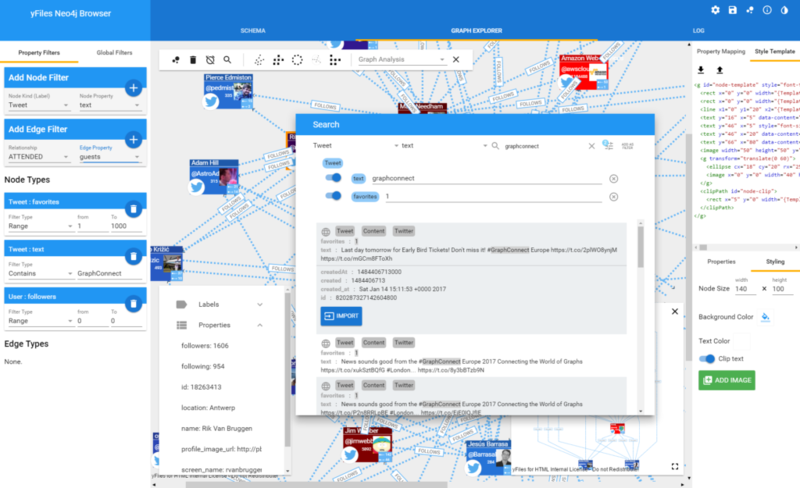 To start exploring the database, we added a convenient search dialog with preview functionality from which the user can import one or more nodes into the visualization. My favorite feature is the ability to use the schema to interactively specify transitive relationships over multiple relationship hops: The explorer will then enable the exploration of “virtual” relationships that don’t explicitly exist in the database. And for the pro-users we also added the option to directly specify Cypher queries. 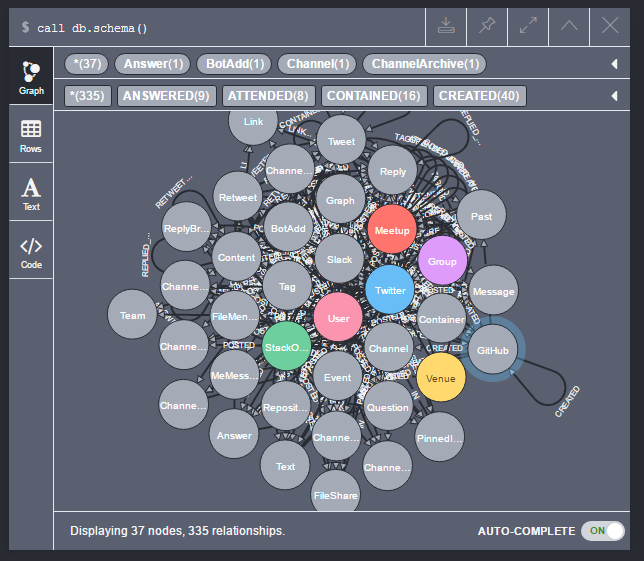 With the right query you can even visualize virtual nodes and relationships! yWorks is a Silver sponsor of GraphConnect Europe. Use discount code YWORKS30 to get 30% off your tickets and trainings. Register for Europe’s premier graph technology event: Get your ticket to GraphConnect Europe and we’ll see you on 11th May 2017 at the QEII Centre in downtown London! 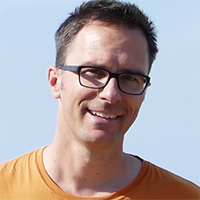 Sebastian Müller has been working in the field of graph visualization for the last 20 years. He loves programming and especially working with graphs and algorithms. As CTO of yWorks, he is responsible for the development of the “yFiles” suite of programming libraries for the visualization and analysis of graphs, diagrams and networks. A link to the tool so I can use it? Follow us on twitter @yworks to stay up to date! You lovely man. This is nearly exactly what we need. This is fantastic tool, congratulations! However the limitation to vizualize only 20 neighbors make me trabbles. Is there any possibility to switch off this limitation? Would love the ability to build upon this code application. Are there plans to release this actual app code in demo applications. I know there is a similar app in the demos for a neo4j explorer, but this code really rocks!!! I’m having a few problems in using the application from a man. For some reason I’m unable to add labels to the templates and have to export the template xml and manually update the xml and reimport. The other issue is I can’t find the dynamic neighborhoods option. This would help in navigating larger graphs. I see it in the screenshots in this post but can’t find the option in the application itself. Any help would be much appreciated.